Six UK companies have been funded a share of more than £460,000 to fast-track innovative technologies that aim to detect people carrying knives in crowded places such as streets, railway stations and major events. Now, with funding from the Home Office and Department of Transport, 6 companies are exploring how solutions involving radar and electromagnetic and acoustic sensors could help detect steel-bladed knives. Recent senseless killings that have snatched young lives away have shocked people across the UK. We are determined to protect families from these devastating crimes, and new technology must play a key role in this, together with effective early intervention work and strong law enforcement. I’m pleased the government has been able to support these exciting and innovative projects which have the potential to rid our streets of dangerous weapons. The safety of passengers is absolutely paramount and we are committed to tackling the scourge of knife crime. I’ve seen first-hand this week the exceptional work groups such as the British Transport Police are doing to tackle this issue, but more needs to be done. That’s why this funding is so important – it will help us identify ways in which technology can detect concealed knives, helping us keep people safe on our railways. Through a Home Office competition run by Dstl through DASA, which sought input from industry and academia, 6 proposals passed the rigorous testing process. Now, Security Screening Technologies Ltd, Iconal Technology Limited, Loughborough University, Xenint Ltd, Thales UK, Advanced Nano Tech and Scientific Ltd are each being funded a share of £463,665 by the government for 6 months to deliver proof of concept. They will be asked to demonstrate their findings this summer. The announcement comes as the Prime Minister today (April 1) hosts the Serious Youth Violence summit in Downing Street, bringing together attendees from a diverse range of backgrounds including law enforcement, health, the voluntary sector and education, and young people with experience living in communities impacted by serious violence. 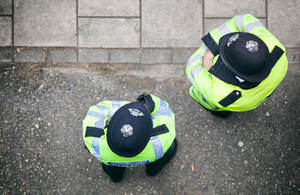 Alongside support for the police, the Home Office continues to focus on early intervention as a key to securing sustainable reductions in serious violence. It recently appointed the charitable foundation Impetus to manage its £200 million Youth Endowment Fund, as a major part of ensuring that more young people are not sucked into a life of crime and violence. Contact: accelerator@dstl.gov.uk or by telephone on 01980 953638.